Twenty years ago, Tigist went in to labour with her first child. She had grown up in rural Gondar in Northern Ethiopia. A daughter to poor parents, bouts of malnourishment went continually untreated, stunting her growth. This situation prevented her pelvis developing and maturing, which is crucial for a safe childbirth. Her labour quickly turned into a mother’s worst nightmare. She experienced excruciating pain for four days, but could do nothing to successfully deliver her baby. On the fifth day, her family begged a neighbour to drive her to a health centre, but by the time she got there, it was too late. Her baby girl was delivered stillborn. Late last year, after living with her fistula for twenty years, Tigist was identified by a WAHA-trained Maternal Health Activist, who noticed her condition. 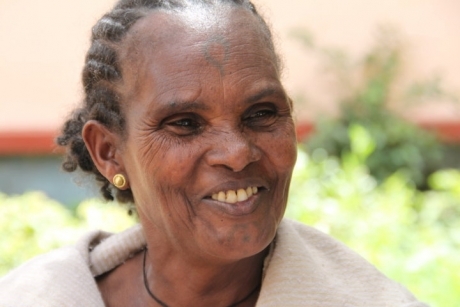 Just a few days later, she was transported to WAHA’s teaching hospital in Gondar, where her fistula was repaired successfully in an operation that only took one hour. Because Tigist had remained sedentary for so many years in an attempt to heal her fistula, she had lost significant muscle tone from her legs. But thanks to the new physiotherapy wing funded by Ethiopiaid supporters, she was provided with daily rehabilitation and slowly gained her strength back. As with all patients who arrive at the hospital, Tigist also received psychological counselling services from trained professionals and quality pre and post-operative care from trained nurses during her stay. Within two months, Tigist was feeling confident and strong enough to return to her community, elated to be cured of an injury that had not only torn her body apart, but her entire life. Women enter WAHA’s fistula hospital in Gondar with little hope; broken and devastated. They leave healthy and happy, gifted a new chance at life. A full fistula surgery costs $300. With whatever contribution you can make, we are so much closer to providing successful treatment to the 30,000 women still living with this devastating condition. WAHA Ethiopia has the capacity to locate and treat 1,500 rural obstetric fistula patients each year – however lack the much-needed funds to provide the surgeries. With your help, another woman will get a new chance at life. You have the potential to make an incredible difference. Please donate today.